To check whether you were affected, you can click here to go Facebook. Users may need to log in.If you were affected, please email our technology reporter at aj.martin@sky.uk with the phrase "Facebook Data Breach" in the subject. Alternatively, you can click on the address above if your web browser supports automatically opening email clients.The changes - which are being introduced globally - come alongside an update to the News Feed which will show people what apps they use and what information is shared with those apps.Users are intended to be able to remove apps that they no longer want in an easier fashion, and as part of this process Facebook will be informing people if their data was shared with Cambridge Analytica.Affected users will automatically be presented with a notice that says: "We have banned the website 'This Is Your Digital Life,' which one of your friends used Facebook to log into. "We did this because the website may have misused some of your Facebook information by sharing it with a company called Cambridge Analytica. "The company's phrase "may have misused" seems to be constructed out of a sense of legal caution rather than its ignorance about whether particular users were affected.Those not affected by the Cambridge Analytica incident will simply read: "You can go to the Apps and Websites section of your settings anytime to see the apps and websites you've used Facebook to log into." It comes as Facebook's founder and chief executive is set to appear before two Congressional hearings this week, being grilled by the Senate on Tuesday and the House on Wednesday.Mr Zuckerberg and his wife Priscilla had private meetings with lawmakers on Capitol Hill on Monday ahead of the hearings.He said in written testimony released by the House commerce committee: "I started Facebook, I run it, and I'm responsible for what happens here." 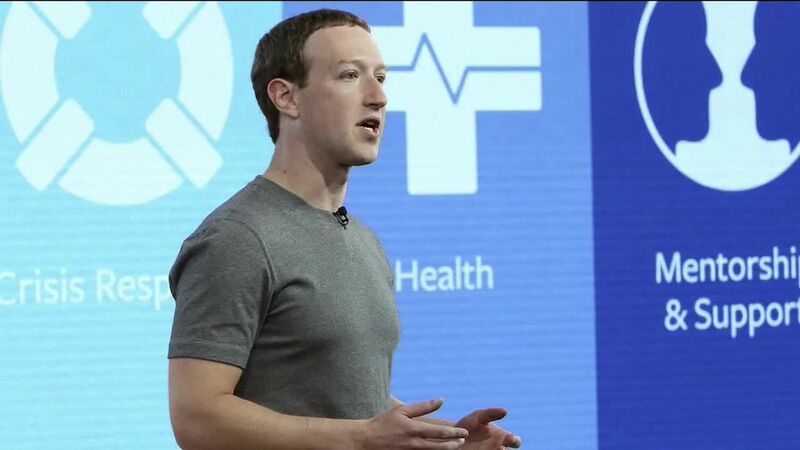 Mr Zuckerberg added that Facebook is "an idealistic and optimistic company" that "focused on all the good that connecting people can bring".He continued: "It's clear now that we didn't do enough to prevent these tools from being used for harm as well. "That goes for fake news, foreign interference in elections, and hate speech, as well as developers and data privacy. "The 33-year-old added: "We're in the process of investigating every app that had access to a large amount of information before we locked down our platform in 2014. "If we detect suspicious activity, we'll do a full forensic audit. "And if we find that someone is improperly using data, we'll ban them and tell everyone affected. "Two weeks ago, Mr Zuckerberg made an admission over the Cambridge Analytica scandal, saying: "You may have heard about a quiz app built by a university researcher that leaked Facebook data of millions of people in 2014. "This was a breach of trust, and I'm sorry we didn't do more at the time. "Although the data was openly given by Facebook to the university researcher, the company has said that this was legitimate and that only its further transfer to Cambridge Analytics was illicit. The university researcher referenced, Aleksandr Kogan, allegedly developed This Is Your Digital Life, which allowed Cambridge Analytica to potentially unlawfully collect the data of up to 87 million Facebook users.Meanwhile, the company has warned that it is "reasonable to expect" that potentially every Facebook user has had their phone number and email address scraped from the site.